Kevin made me 2 long hills today. I planted my watermelons, muskmelons, cucumbers, zucchini, spaghetti squash, and 3 kinds of pumpkins in them. He used the hiller/furrower attachment for the Troy tiller. Sure made it easier for me. It just so happens that it created a middle tiny hill, so I planted a row of kohlrabi, turnip, and radish down this row. They should be about gone by the time stuff starts vining. This is the best picture I could get of the whole garden. Still cut off part of it on the left/front. Dark green you see at the back are the potatoes. Asparagus in front of potatoes are in desperate need of weeding. The green you see to the left of the tators are the grapes. I believe you can also see the fence Kevin helped me put up for pole beans, although the beans are not up yet. 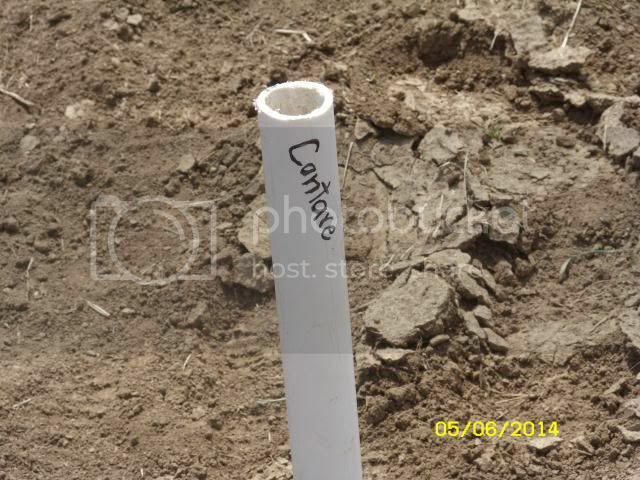 I planted about 9 different kinds of beans, so I came up with this way of marking them. I cut some leftover PVC pipe in 15" lengths and wrote the name of the bean on them in magic marker. These are also the row markers. Working great so far. I show more as things start growing. At least now it is supposed to actually warm up so maybe my stuff will take off. The tomatoes are not happy with the cooler temps, but they are hanging in there. Re: The Garden Is Planted! It all looks wonderful, Winona. My, after seeing your large, beautiful garden, I'm afraid to post pics after I get mine done. Mine will be sooo tiny. Lol. Looks great. I need to hoe mine as soon as it dries out. Oh, I love it! All of that open space just makes my heart happy . Now if we can just keep your pesky spraying neighbor away from your beautiful garden! thats what I was thinking Bobbie. Winona what a big beautiful garden. Mine is tiny compared to yours and I have a family of 7. I havent even tilled mine yet as my tiller needs a tire fixed. Love the pictures. That's my dream garden--a huge space with lots of room to grow all sorts of things. Hope it stays safe and grows well! Winona, that is absolutely huge!!!! Is it usually this big? When the veggies start rollin' in you better not have many plans, cause it looks like it may be you and your canner for a while. Hope you are stocking up on those jars and lids. Wow, Winona, that garden reminds me of my old homestead from last year where we did something about that size. 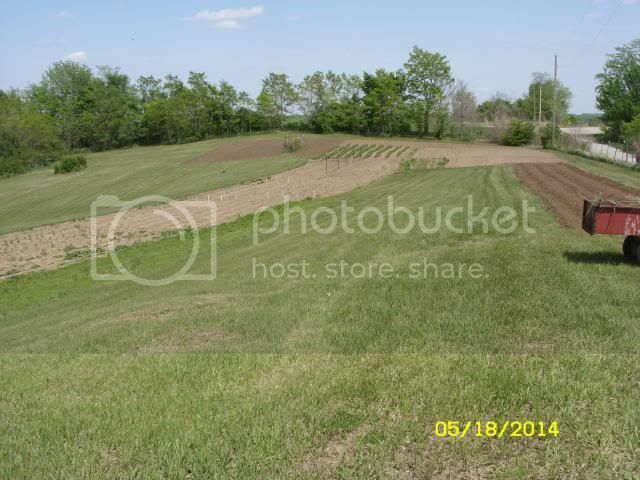 In our new home we have a smaller lot and I have been going back and forth on whether or not to have a garden or not. I made my decision and cleaned up a spot behind an outbuilding that is full of sunshine. 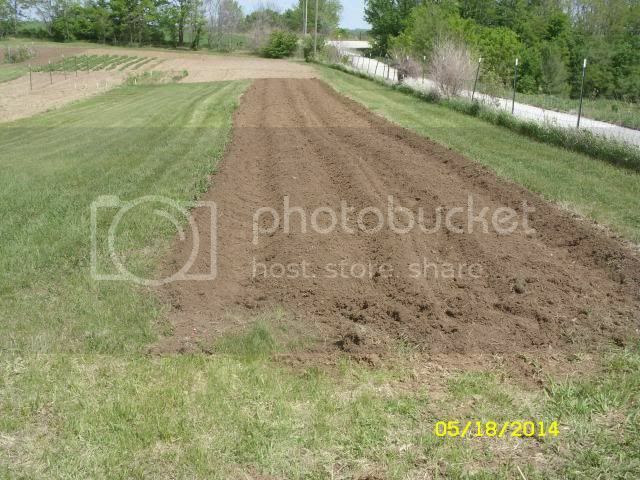 We tilled it up and the soil is beautiful! We tilled about three times with the large tiller and then I used my little tiller to fine tune it. We planted the garden on Monday. It will be smaller than what we're used to but our family is shrinking when the kids all go to college in the fall. We put in 8 tomatoes, 4 peppers, 8 cabbage, 4 broccoli and two rows of green beans. I put up a sprinkler and now we pray the critters don't find the garden. If they do, we have a roll of fencing we can put up. I'm so happy we decided to do this. My young adult/college kids helped me even though they won't be around at harvest.